T-NOVA is driven by a strong industrial core assisted by innovative SMEs and acclaimed academia in the field, with the aim of presenting an integrated solution for the offering, deployment and management of Virtualised Network Functions over composite (Network/IT) infrastructures. 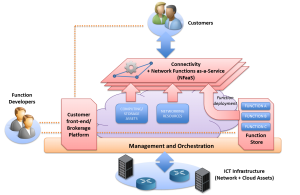 In specific, T-NOVA aims at designing and implementing an integrated management architecture, including an Orchestrator platform, for the automated provision, management, monitoring and optimization of Virtualised Network Functions over Network/IT infrastructures. T-NOVA leverages and enhances state-of-the art cloud computing management frameworks for the elastic provision and (re-) allocation of IT resources assigned to the hosting of network functions. It also exploits and extends Software Defined Networking aspects, focusing on the Openflow technology, for efficient management of network resources, including network slicing, traffic redirection and QoS provision. In addition to allowing network operators/service providers to efficiently handle and manipulate NFs for their own needs, T-NOVA introduces an additional innovative concept: it also considers the offering of Network Functions to operators’ customers, as value-added services (Network Functions as-a-Service, NFaaS). Service providers are offered the unique potential to enhance the traditional connectivity services with virtual network appliances (virtual gateways, proxies, firewalls, IDS/IPS, media transcoders, traffic analyzers etc.) which are provided to their customers as-a-Service, eliminating the need to acquire, install and maintain specialized hardware at the customers’ premises. b) a set of associated Network Functions, ranging from flow handling and control mechanisms to in-network packet payload processing, according to customer needs. In order to support these functions, computing (processing/memory/storage) resources are allocated by the Orchestrator platform within the infrastructure and assigned to the virtual nodes participating to the offered service. The overall concept of the T-NOVA architecture is visualised in the figure below. In order to facilitate the involvement of diverse actors in the NFV scene, T-NOVA introduces an innovative “Network Function Store”, following the paradigm of already successful OS-specific “App Stores”. The Network Function Store contains NFs by several third-party developers, published as independent entities and accompanied with the necessary metadata. The Store allows customers to select the virtual appliances which best match their needs, “plug” them into their existing connectivity services and configure/adapt them according to their needs. 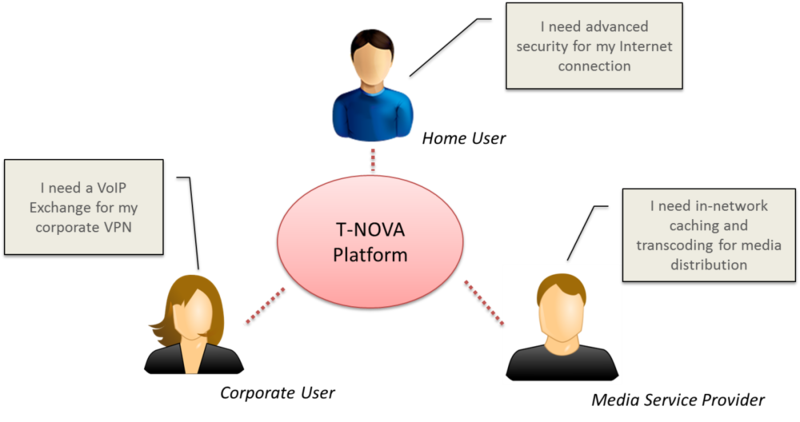 In order to facilitate competition and support different value chain configurations, a novel Brokerage Platform is also established, allowing customers to transact with the T-NOVA Service Provider and multiple third-party Function Developers for selecting the best service bundle that suits their needs. Upon receiving the user’s requests, the brokerage platform jointly examines i) the available Network and IT resources and ii) the available functions at the Function Store and comes up with specific economic/technical offerings and associated billing models. Via the Function Store and the Brokerage platform, T-NOVA aims to introduce and promote a novel Marketplace for NFV, introducing new business cases and considerably expanding market opportunities by attracting new entrants to the networking market. Especially SMEs and academia can leverage the T-NOVA architecture by developing innovative cutting-edge Network Functions as software modules, which can be included in the Function Store, and rapidly introduced to the market, thus avoiding the delay and risk of hardware integration and prototyping.